Jones said after a 37-9 loss to Philadelphia on Sunday night that he wants "unprecedented accountability to the ownership"
The Dallas Cowboys have lost both games without Ezekiel Elliott, and owner Jerry Jones is still trying to explain what the six-game suspension for his star running back has to do with his objections over a contract extension for Commissioner Roger Goodell. Jones said after a 37-9 loss to Philadelphia on Sunday night that he wants "unprecedented accountability to the ownership" while again referring to a desire to revisit the power Goodell has to punish players under the collective bargaining agreement. Elliott's suspension stemming from alleged domestic abuse finally started after a two-month legal battle, and with the Cowboys coming off a three-game winning streak that had the defending NFC East champions headed in the right direction a year after having the best record in the NFC at 13-3. Now Dallas (5-5) has been outscored 47-0 in the second half of consecutive losses without last year's NFL rushing leader, and the team trails the division-leading Eagles (9-1) by four games with six to go. Philadelphia has won eight straight games, its most since the 2003-04 seasons. Elliott was suspended following a yearlong NFL investigation after prosecutors in Ohio cited conflicting evidence in declining to pursue the case. "I want unprecedented accountability to the ownership," Jones said after the Cowboys' most lopsided loss at 8-year-old AT&T Stadium on the same night he received his Hall of Fame ring in a halftime ceremony. "It's unfortunately that motives are being pressed, (that) it's all about Zeke. Zeke is over. But some of the things that make that happen are still around." 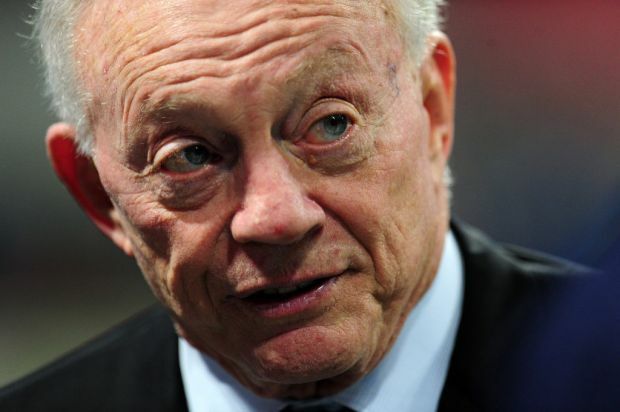 Dallas Cowboys owner Jerry Jones is not backing down in his very public spat with NFL Commissioner Roger Goodell. Jones wouldn't address questions about a report that he threatened to go after Goodell's job when the commissioner told him the suspension was coming this past summer. The 75-year-old Jones also pushed back when told that Jonathan Kraft, son of New England owner Robert Kraft, had said that Jones suggested the Krafts move on when they were upset over quarterback Tom Brady's four-game suspension over Deflategate two years ago. "Those circumstances are so different," Jones said. "We're not going to write anything -- a book here. They're just different. But I didn't hear that. I think the world of Jonathan." Cowboys owner Jerry Jones received his Hall of Fame ring during halftime of the game against the Philadelphia Eagles. The Cowboys lost 37-9 to fall to 5-5 on the season. Coach Doug Pederson wasn't ready to speculate on the head injury that left the Eagles without a kicker. They just had to adjust with Jake Elliott out of the game. "I've got to watch a bit of the film and see," Pederson said. "I know it was in the first half." Possibly on the game's opening kickoff, when he was in on the tackle after Ryan Switzer's 61-yard return . Elliott did make the extra point and kicked off after Philadelphia scored a touchdown on its opening drive, but was wide right on a 34-yard field goal attempt at the end of the first quarter. Without Elliott after halftime, linebacker Kamu Grugier-Hill kicked off . But Pederson decided they would go for 2-pointers after every touchdown -- and they converted on three of four. 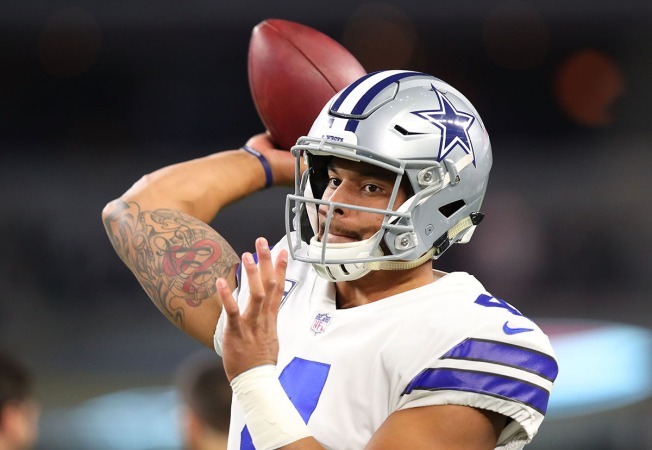 After throwing a career-high three interceptions, Dak Prescott was already thinking about getting back on the field. "I'd play tomorrow if I could," he said. At least it is a short week, with the Cowboys' annual Thanksgiving Day game against the Los Angeles Chargers. The first pick was a tipped pass, the second was one Prescott called "boneheaded, simple as that." The third, he said, was a miscommunication with a receiver when both of them were just trying to make a play. Anthony Hitchens was starting for injured Cowboys linebacker Sean Lee. Now Hitchens is hurting. Hitchens left early in the second half with because of a groin pull, and will have an MRI on Monday. And Lee is likely to be out again with his hamstring issue. Jaylon Smith was splitting time with middle linebacker Justin Durant against the Eagles before moving into Hitchens' spot. Smith and Durant could be playing even more Thursday. Philadelphia has two of the three most-lopsided wins by a visitor since AT&T Stadium opened in 2009. The Eagles won 33-10 on Thanksgiving Day three years ago, though the New England Patriots then won by one more point -- 30-6 -- in a 2015 game at the Cowboys.